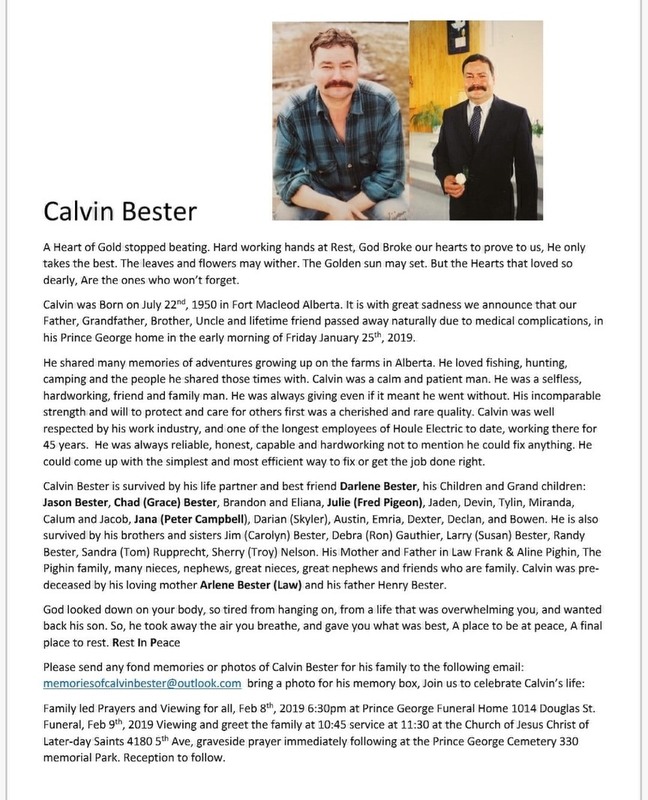 You may have heard that Cal Bester passed away on Friday, January 25th.Cal was part of Houle for over 45 years and he will be missed. Friends and family will be celebrating his life in Family led Prayers and Viewing for all, Feb 8th, 2019 6:30 at Prince George Funeral Home 1014 Douglas St. Funeral, Feb 9th, 2019 Viewing and greet the family at 10:45 service at 11:30 at the Church of Jesus Christ of Later-day Saints 4180 5th Ave, Graveside prayer immediately following at the Prince George Cemetery 330 memorial Park. Reception to follow.